Today’s #OneADayInMay litter was collected on my way home this evening, and I tend to grab pieces at random so I think this is an average representation of rubbish in Chippenham. The ACE (alcohol, carbonated, and energy) recyclables are well represented, and Coca-Cola and Red Bull are some of the most commonly littered brands we find. Sweet wrappers and on-the-go food containers are also typical. The only thing missing this time is a crisp packet! This has been a busy week, with work travel taking me to Bristol yesterday and London today. 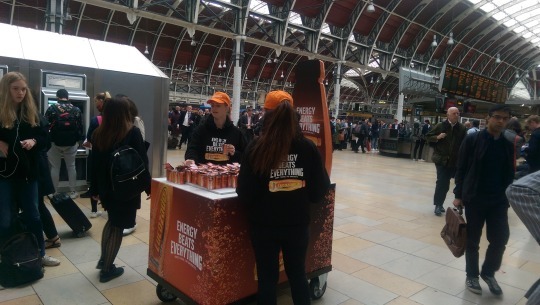 While yesterday I was pleased to see the efforts that Bristol is making in an attempt to combat litter, walking through Paddington Station this morning made me shutter: a giant Lucozade bottle was like something out of a litter pickers nightmare, but what was actually happening was a sad reality. As part of a free giveaway, Lucozade were giving out small sample cans, each with a piece of paper attached (a voucher I’m assuming). It doesn’t take a crystal ball to know that these little bits of paper were ending up on the floor and formed a trail leading out the exit. I would like to know whether companies do any type of litter mitigation assessment before running an event like this. Planning a trip to the moon requires a lot of forethought, and there will always be unknowns that cannot be foreseen when there are so many variables. But giving people an item with something loosely attached? This is guaranteed to turn into litter and is something that the company should be responsible for addressing from the start.